Aquatic Life seen in the Highlands of Scotland. The Moray Firth on the east coast of Scotland is one of only three areas in UK waters that support a very large resident population of Bottle-nosed dolphins. 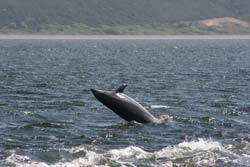 The best place to observe them is at Chanonry Point opposite Fort George on the Black Isle. To get there travel from Camerons Cottage to Inverness and go north over the Kessock Bridge. Turn right at the first roundabout marked to Fortrose and Rosemarkie. Go through the sprawling village of Avoch and at the next village of Fortrose turn right opposite the Police Station at the signpost to Chanonry Point - be careful -the sign can be hidden by overhanging branches of trees. Drive down a single track road through a golf course to the car park at the end and follow signs to the beach. Walk along the sands, take a picnic and make a day of it. Be careful of paddling as a basking shark has been seen in these waters. The best time to be sure of seeing the dolphins is 1 to 2 hours after LOW TIDE as the salmon come in on the rising tide followed by the hungry dolphins. Common and grey seals can often be spotted along both east & west coast locations. The roads running alongside firths and estuaries up the north east coast are often good vantage points to see common seals basking on the rocks. The common seal has a short muzzle with a rounded head and a uniform spotted coat that is paler underneath. They haul themselves out of the water and lay on the sand or mud banks in full view. Common seal pups come into the world wearing its first adult coat and are therefore not as vulnerable as the grey seal pups that are born with a conspicuous white coat and therefore tend to congregate on the remote rocky west coast and islands.Boat trips off the west coast at Plockton are organized to see both types of seal. 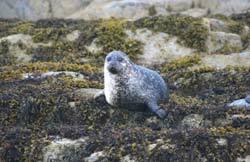 The largest breeding rookery of grey seals is on the Monach Isles, west of Benbecula. The thousands of grey seals that gather there every October make it the largest grey seal rookery in the world. Although otters are more abundant in the north-west sheltered coves and coasts of Scotland they will often leave the safety their habitat to forage inland for food, running up the narrow burns and swimming in lochs before moving back to their ‘holts' on the west coast. They are quite large creatures, about one metre in length, a third of which is the strong thick tail. They are equally at home on land or in water and find their food from a range of habitats. Their diet consists mainly of fish and eels but they will take a variety of other foods - birds eggs, frogs, birds and small mammals, waterside birds and divers. Otter tracks [5 webbed toes with a central groove in the ground where it is dragging its heavy tail] can sometimes be seen on a sandy bank of a river near a loch. Mud flats around the local coast teem with waders and various seabirds.